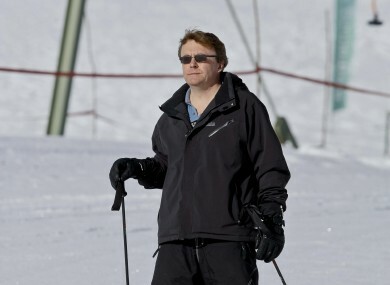 Prince Friso was taken to intensive care after being engulfed by the avalanche while skiing in Austria today. AN AVALANCHE BURIED and seriously injured the son of the Dutch queen earlier today, leaving him in intensive care in Innsbruck, Austria. It was unclear how critical the condition of Prince Friso was. The Dutch government, which initially said his life was in danger later issued an update saying “his condition is stable but not out of danger.” Stefan Jochum, a spokesman for the Lech ski area where the accident occurred, said Friso’s condition was serious but his life was no longer at risk. Jochum said the accident happened early this afternoon as the prince and three other skiers were on slopes away from the marked Lech ski runs and laden with snow after weeks of record falls. The Lech municipal office said a regional avalanche warning issued for the day was four on the five-point scale, meaning the danger was high. “A snow slide came down and the prince was buried as the only member of the group” said Jochum in a telephone interview. A rescue helicopter was on the scene within minutes and after Friso was located, he was resuscitated on the scene and flown to the hospital, Jochum said. The Austria Press Agency cited Lech Mayor Ludwig Muxel as saying Friso was buried for about 20 minutes by a snow mass that measured around 30 meters (more than 30 yards) by 40 meters (more than 40 yards when it hit him. Dutch national broadcaster NOS broke into its regular programming to give the story rolling minute-to-minute coverage as the news broke, speaking to medical experts and avalanche specialists. Friso, 43, was in Lech along with other members of the royal family. The second of Beatrix’s three sons gave up any claim to the Dutch throne to marry Dutch commoner Mabel Wisse Smit, in 2004. The pair have two daughters, Emma and Joanna. Email “Dutch prince buried in Austrian avalanche”. Feedback on “Dutch prince buried in Austrian avalanche”.